Hybrid heat pump water heaters (50-gallon) with an energy factor of 3.24 available to our members at cost: $1,223.67* + tax. These are generally three times more efficient than a standard water heater. Energy Factor must be greater than or equal to 2.0 to qualify. Click here for a program application. Please contact Energy Advisor, Jake Taylor at 877.463.7165 before making any purchases. 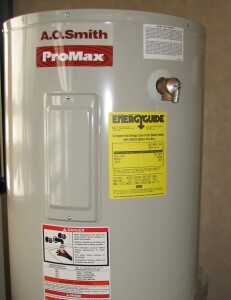 Electric water heaters (50- gallon) available to our members at cost: $376.90 plus tax. They may be picked up at our location during normal business hours, Monday – Friday, 8:00 am - 4:30 pm. Other sizes available – call for pricing and to order. A. O. Smith water heaters are made in the U.S.A.